Eleaf is bringing in the future with the epic Eleaf Lexicon Kit with ELLO Duro Tank featuring multiple glowing LED lights along its chassis that are available in seven different color options. The Kit as a whole has all-encompassing dimensions of 132.5 x 45 x 31mm that weigh in at 228.8g. 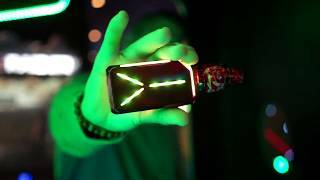 To further enhance the myriad of lights that offer a one-of-a-kind show in the dark, the Eleaf Lexicon Mods LED front display screen can be put into stealth mode, allowing you to vape without the screen lighting up. Operating the easy to read display screen is a three-button interface consisting of an oversized firing button and two adjustment buttons. The firing button is located along the side of the chassis and the two adjustment buttons are on the same face as the LED display screen, near the bottom of the device. Each button has a sharp geometrical shape that adds to the sophistication and overall appearance of the device. This user-friendly display screen not only shows all the current output settings, but also a puff counter and dual battery life indicators. The Lexicon Mod is powered by dual 18650 batteries (not included) that are inserted through a hinged bottom battery access door. The installed chipset allows for an incredibly rapid firing time and an operational voltage all the way from 0.5-8.0V. A Micro-USB port located just below the adjustment buttons not only serves to quick-charge your device but can also be used to install firmware upgrades as they become available. The Lexicon Mod offers a Variable Wattage mode with wattages of 1-235W within atomizer resistances of 0.05-3.0 ohm and your choice of vaping effect. Temperature Control mode allows for temperatures between 200-600F (100-315C) within atomizer resistances of 0.05-1.5 ohm. This mode also allows for TCR functionality with multiple Memory modes and the use of Stainless Steel, Titanium, and Ni200 heating elements. In both Temperature Control mode and Variable Wattage mode, there is a preheat function to further enhance each draw. With a center mounted threaded 510 connection, the Lexicon Mod is big enough for sub-ohm tanks, RBA, and RDAs with 26mm diameters or less without overhang. Safety features on this device include over-charge protection, over-discharge protection, over-current protection, and reverse polarity protection. For the Lexicon Mod, Eleaf has carefully chosen the highly compatible ELLO Duro Sub-Ohm Tank attached through a threaded 510 contact pin. This tank consists of a superior Stainless Steel frame supporting distinct Acrylic tubes and drip tips that match. The Acrylic reservoir extends out to a 28mm diameter, giving the tank a massive 6.5mL e-liquid capacity. Although the standard straight Pyrex glass tube is available, the Acrylic tube will offers a unique look that stands out from the rest. To fill the 6.5mL tube, Eleaf has given this tank a retractable top-filling method that simply involves sliding the top cap back to expose the fill port. Be sure to let your favorite e-juice fully saturate the internal wicking material to get the best flavor as you vape. To customize airflow, the ELLO Duro Sub-Ohm Tank features triple bottom adjustable airflow slots that can be left all the way from fully open to fully closed. Pre-installed inside the ELLO Duro Tank is the 0.15 ohm ELLO HW-M Multihole coil head rated for use between 60-100W. To further explore the HW coil series, Eleaf has made the ELLO HW-N Net 0.2 ohm coil head rated for use between 40-90W available with this kit. Both of these atomizer heads consist of Kanthal coils punctured in unique ways to distribute heat more quickly and evenly. For optimal wicking, Eleaf utilizes 100% Organic Japanese Cotton, further enhancing flavor and vapor production. The Eleaf Lexicon Kit with ELLO Duro Tank has been brought to life by the next generation of vaping. If you want a device that can entertain as well as perform, then this is the kit for you.